Every century, and every twenty-five years of the century, We, the Masters of Wisdom, gather together to assess the success or otherwise of the many projects and plans which We have previously set in motion. In this way We know how well certain plans are faring and, if not, can make the necessary adjustments and changes before harm is done. As We look back on the twentieth century We see an astonishing picture. Truly it was one of titanic struggle and achievement, a veritable battleground for warring forces so opposed and committed. It saw humanity at last, battleweary but triumphant, come of age. From Our perspective, last century saw humanity reach adulthood, ready to take decisions and to think its own way forward. The trials and tribulations were many and daunting, calling out from men the best that was in them, preparing them for the decisions which lie immediately ahead. The two world wars of the past century saw humanity divide itself in two: those who, for all their faults, stood on the side of Light, for freedom and justice for all and the democratic ideal; and those who worshipped power for its own sake, who stood on the dark side of life and sought to enslave the minds and hearts of those weaker than themselves. The triumph of the Forces of Light ensures that men know better the reality in which they live, and the nature of the materialism against which they fought so bitterly and at such cost. Thus was forged a sense of the grandeur of human life and also of its sacredness and worth. It is this achievement which has made possible the re-entry into the world of the Christ and His group of Masters. The events of the twentieth century have been momentous. They constitute the major trials of the World Disciple and shown him ready, when led by Us, to battle against and conquer tyranny, to right the wrongs of the past and to grasp the fact of Brotherhood in all its beauty. Some, surveying the world and the actions of small but ambitious men, doubt that this is possible. They see only the outer, transient events and not the changes wrought on men under the laws of evolution. Our hopes for men are high. This is said not lightly for We know that much needs still to be done to ensure the future for men and planet. Our view of men is based on long association with the trials and tests of life which have brought men to readiness to inherit their destiny. Ray structure: Soul: 6; Personality: 6 (subray 6); Mental: 6 (4); Astral: 6 (6); Physical: 7 (3). His point of evolution was 1.6. A billion Catholics, and many of other faiths or none, are now mourning the death of the best known Pope since Pope John XXIII. How different were these two incumbents of the Throne of St Peter. One, John XXIII (1881-1963: S: 6; P: 2 (6); M: 4 (1); A: 6 (2); Ph: 3 (7). His point of evolution was 2.0), a revolutionary, a liberator, loosening the stranglehold of authority and infallibility of a two-thousand-year-old church; the other, John Paul II, moving powerfully in the opposite direction. Few Popes have claimed more intensely the autocratic right to lay down the laws and rules of life for so many. Hence the shrinking congregations and colleges which accompany his undoubted popularity to the end. 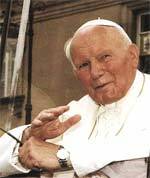 The secret, I believe, is that John Paul II was a consummate actor. He began his early working life as an actor, and as Pope he achieved celebrity. He made the Pope, the head of the Catholic Church, visible. Unlike all his predecessors, he worked on the largest scale, made the broadest gesture, and played to audiences of millions, worldwide. In an age of media dominance he dominated the media and his people loved him for it. From our point of view, the most interesting thing in this most interesting life was that since 1984 Pope John Paul was mentally impressed by the Master Jesus (resident in Rome since that year). It is this which accounts for his powerful support for human rights, his advocacy of debt forgiveness and a more just world for all. It is this advocacy that brought millions to love him despite his autocratic views in sexual and other matters. They loved the man rather than the Pope. Had the plans for Emergence gone more to schedule, John Paul would have been the last Pope. The plan is for the Master Jesus to take over the Throne of St Peter in due course. Q. I believe that the Master Jesus will become the Christian church’s Pope in the future, hence, beginning the true Pontificate. A. The Master Jesus will not become the Christian church’s Pope in the future. He will, however, “take over the throne of St Peter and the true Apostolic succession will begin” — a very different thing. The Master Jesus will guide all the Christian Churches, having cleansed them of the man-made doctrines and dogmas of these groups. Q. When the world, under the inspiration of the Masters, develops a new global religion from the old dogmas of today what will become of the position of Pontiff as it is known today? A. The position of Pope or Pontiff will become redundant. The Master Jesus will take charge of all the Christian groups. Q. Will there always be a Master at the head, so to speak, of the world religion? Q. As millions of Catholics held a vigil and prayed for the Pope both before and after his death was there a blessing from Maitreya or the Master Jesus? A. There was a Blessing from the Master Jesus. Q. People power is a trend that the media is beginning to notice increasingly. Kyrgyzstan is the latest instance. (1) Was it ‘helped’ by agents provocateurs? (2) Was the Ukraine ‘orange revolution’ fuelled by agents provocateurs? (3) Will the Kyrgyzstan example trigger a domino effect across the region, just as each previous example of people power seems to inspire the next uprising? A. (1) No. (2) Yes, on both sides. (3) Yes, most likely. Q. John Bolton is George Bush’s choice for US Ambassador to the United Nations. Bolton has always been fiercely (not to say fanatically) opposed to the UN and might realize the fears of many by undermining the UN from within. (1) Is this the US intention? (2) If true, what would be the consequences for the UN? A. (1) I am afraid so, yes. But the US has always seen the UN as a vehicle, only, for the implementation of US interests. (2) For a time the US will continue to dominate the UN or act unilaterally — but its time is running out. Q. Is it true that US soldiers — particularly those who are seriously injured, permanently maimed and/or traumatized — are being brought back to the US as secretly, as low-key as possible? Q. There is a group of countries — India, Japan, Brazil and Germany — which would like to become members of the Security Council. Is this a sign that the UN Security Council will change or is it just nationalism on the part of those countries? A. It is both. It is nationalistic, of course (they want a greater say in the world), but it is also an understanding that the veto which a small number of countries — the five original members of the Security Council — hold really distorts UN action. For instance, Iraq had 19 UN resolutions outstanding, not fulfilled, and that was one of the reasons given for the attack. If it had no outstanding resolutions, they still would have been attacked. That was just a ploy — Israel has 63 resolutions still outstanding to which Israel has not responded because the veto of the United States prevents any action being taken against Israel. At long last some nations are getting more and more impatient with the overwhelming dominance of the Security Council, so it now has 25 members instead of 15. They enlarge it so that they are allowed a voice, but still the veto-power only applies to the original five members. I would say that the true value of the United Nations is misunderstood; it has not yet been grasped by some nations and by humanity in general. The Masters call it “the hope of the world”. The United Nations is literally the future hope of humanity, and unless we can keep it going and shake out of it the things that hold it back in its action, the worse it will be for humanity. The first thing to go, I believe, should be the Security Council. It has done its work; it is outmoded and no longer functions in a truly useful or democratic way when solving dire problems in the world. One of the most dire problems is the Israeli/Palestinian situation, and that is totally unchangeable because of the veto which America has over it. America is only interested in the United Nations so long as it can control it. In America you would be surprised, the UN is almost a dirty word among some people. Many Americans, those who would automatically vote for Bush, for example, hate the very idea of the United Nations. On the other hand, those who would vote for Kerry or Clinton or any Democrat would have a different viewpoint, but even they would not understand fully the importance of the United Nations. The first thing to go, I believe, is the Security Council and the veto that goes with it. Then we will have all the nations, the society of nations, the talking-shop of the nations, the United Nations Assembly. The Security Council was put together to control, somewhat, countries like Russia — perhaps the Chinese, but certainly Russia — in the years that followed the end of the war when the Cold War was on. Being America and extremely dominant and combative, it has won the day and controls what Israel does to some extent, although Israel is largely out of control, but the USA at the very least makes Israel stronger. It controls what Israel does in the sense that they always use the veto, which otherwise would commit the Israelis to having to respond to the resolutions. There could be a threat, such as an economic embargo, but America makes sure that that does not happen because they work with Israel. America (that is, the Pentagon), Israel and certain states in Eastern Europe are the new Axis Powers in the world. On Saturday 26 February 2005 my friend and I were arranging a stand in the old city centre of Utrecht when a simply dressed man, about 40 years of age, came to us. He wore a knitted cap with earflaps and strings to tie under the chin and he had a small rucksack on his back. He seemed a tranquil person and in the conversation that followed he gave the impression of choosing his words with care. He was a nice, easy-going fellow and at the same time very polite. He shook hands with me and said in a very polite manner: “Thank you for this conversation.” I asked him where he was from and he responded: “Harderwijk.” I told him how to contact the group in Amsterdam, as this is not too far from where he lives. For a moment he looked at my friend, and went away. On 8 March 2005 we were driving back home from Brooklyn, New York, to Troy, New York (normally three-and-a-half hours’ drive). The temperature sharply dropped and a storm warning was in effect. After one-and-a-half hours of driving, passing through New Jersey Throughway at 75mph, we moved onto ‘black ice’. At that point we were in the far right-hand lane, next to the huge concrete wall. The car began to swing and was about to go into the wall. I managed to drive it away from the wall, but it was swinging wildly and then began to cross each lane diagonally while spinning 180 degrees, again and again. All this was happening at 75mph since I couldn’t hit the brakes on ice. We could see cars and huge trucks. Being now all the way in the left lane, our car hit a 30cm-high partition. Our front wheels must have been facing the partition at that moment, because we jumped over the partition and flew up in the air — out of the way of the huge trucks. Immediately after the partition there is a thick steel-mesh fence, 2.5 meters high, divided every 5 meters or so by tall metal poles. Behind this fence are big trees. This dividing strip is about 4-6 meters wide, with the New Jersey Throughway on either side. Miraculously, we flew through the precise spot in the fence where the steel mesh had been previously smashed (probably by a truck), and precisely between the metal poles. Our car landed on top of the flattened fence and a felled tree next to it, ran through the entire dividing strip and then jumped onto the shoulder on the other side of the Throughway. Only then I managed to get back control of the car and drove to the nearest stop. Miraculously, we were OK. We ‘passed’ the concrete wall, many cars and trucks, steel fence, trees and even cars on the other carriageway. I have to mention here that in our car we had great company: three majestic Buddha statues that we purchased only three days ago. No one had a scratch — including us and the car! During our drive home, we saw many accidents involving a massive number of cars. Driving in that snow blizzard became incredibly difficult and it took us another four-and-a-half hours to reach home. Were we saved by someone special? (1) On 19 March 2005 my colleague Heather and I went on the London peace rally. There was a large turnout of people of all ages and the atmosphere in the warm sunshine was up-beat and positive. The speakers at Trafalgar Square were enthusiastically received by the crowd. Towards the end of the speeches a man standing a short distance away caught our attention. He was a late-middle-aged Afro-Caribbean man, dressed in a beige jacket and grey trousers. His tight curly hair was partially covered by a dark baseball cap. He seemed to exude strength and fitness and he reminded us of a guise that Maitreya has used before. We moved closer and stood a short distance behind him. I found myself thinking: “If you are Maitreya, please turn around.” He didn’t comply and I regretted my impoliteness. From our improved position we watched him closely and laughed conspiratorially. We took in as much detail as we could — his clothes, rather worn shoes and the shopping bag he was carrying. What was in the bag? We strained to see. It looked like anti-war posters. A piece of paper with hand-writing on it was stuck on the side of the bag but was obscured by his leg. We got a tantalizing glimpse of the first letter but his leg covered it up again. His leg seemed to move like a pendulum, revealing no more than two or three letters and I realized we were being teased. Then he turned around and with a quick glance looked in our direction. I thought his eyes were so dramatic I could see them flash. Soon he looked around again and this time in a more expectant manner. Shortly after that he moved away. After a while Heather turned to look — someone had bumped into her rucksack giving her a push forward. It was the Afro-Caribbean man hurrying past with a mischievous look on his face. He then stood a short distance away smiling all the time as he listened to the last speaker. Finally he moved on. The fun we had had seemed to revive us and we no longer felt cold and tired. (2) On 31 January 2005 I was on my way to the Share International office. As I sat on the train at Richmond station a woman got on who was instantly friendly and talkative. She was just going one stop to Kew where she lived. She asked me what I was doing and I said I was on my way to north London where I did some voluntary work. She was eager to find out more as she wanted to do voluntary work herself now that she had retired. She had already made enquiries about this, mentioning a well-known charity, but the work involved lifting heavy items and she wasn’t able to do this because of a back problem. I empathized with her as I have a similar problem. I told her about the Reappearance and she listened with enthusiasm saying she wanted to attend Benjamin Creme’s lecture. Her daughter would be interested too. They would also like to attend the Richmond Transmission Meditation. She said she was a Buddhist and that Jesus was the first Buddhist. I said Jesus came 600 years after the Buddha and she agreed but said He was still the first Buddhist. Our conversation had to end as we were approaching her stop. In the rush I quickly wrote down some relevant information including my phone number. She said I could have her number but there wasn’t enough time to write it down. Afterwards I thought about this meeting and wondered at some of the coincidences involved. Was she anyone special? (3) On 20 February 2005 I was on the train making my way to the Share International office. During the journey I noticed a man who was changing seats. He walked in my direction, smiled and sat down in the row in front of me. He appeared to be in his 20s and was dressed as an Orthodox Jew. He turned round and asked me if the train was going to Dalston. I said I wasn’t sure as I was going only to Gospel Oak. He stood up and started looking at a map. I joined him and we established that he was on the right train. Then he came and sat down opposite me and we talked. When I said I was on my way to do voluntary work he wanted to find out more. He asked if I had a certificate for this and puzzled, I said no. He said he thought it was necessary to have a certificate in order to do voluntary work. He did voluntary work for CARE in New York for 3 years and needed a certificate to do this. He wanted to know what the work was about and I said it was to do with spiritual matters. He pursued the conversation and I started telling him about the Reappearance. I was surprised when he listened with ease and nodded in agreement at times. He said he was Jewish and in his religion they are also waiting for a new Teacher. I said that even some people who didn’t necessarily accept the Reappearance story felt that some extraordinary event was about to happen. He said, yes, and this has happened since the death of many people in the Twin Towers in New York. He hurried me along when I said we didn’t ask people to believe the information. This seemed irrelevant to him. He asked about the office work at Share International — what it entailed and were there many phone calls. Did I work there full-time? This reminded me that I have been thinking lately that I could do more. I mentioned about Transmission Meditation and he was very interested, asking various questions. How did we manage to keep our attention up? I talked about the use of ‘OM’ and said that staying aligned got easier with practice although I didn’t find it easy. The journey went very quickly and soon we reached my stop. He stood up politely and we said goodbye. I said how much I had enjoyed our conversation. I got off the train feeling uplifted and thinking that the world was indeed ready for Maitreya. Was my travel companion just an open-minded young man or was he someone in disguise? On 15 November 2004 I was in the dental chair. A mould was being taken of my gum, and when the dentist pulled it out of my mouth a small piece fell onto the back of my tongue. I was unable to take a breath, as my air passage was cut off. I was unable to budge the object. While trying to figure out how to inform the dentist and his assistant that I was in trouble, I noticed that my mouth was wide open. Then suddenly there was a tremendous force of air flowing inside my mouth, and I could feel the object being lifted up and forcefully thrown out. It landed in the middle of the room, I was then able to breathe. I knew someone or something came to my rescue: was it a Master? A driver has escaped with only a small bump on the head, cuts to his hand and a stiff neck after his car crashed through a barrier on the M25 motorway, hit a tree, plunged 80 feet (narrowly missing an electricity pylon) and landed — upside down, in a tangle of flattened, twisted metal — on a narrow island in the middle of the River Lea at Waltham Abbey, Essex, UK. On 22 August 2004, during a jump above Johannesburg Skydiving Club at Carletonville airfield, West Rand, South Africa, 24-year-old skydiver Christine Mackenzie’s parachute failed to open and lines on her reserve chute snapped and became tangled. Plunging 11,200 feet in a 45-second, 160-km-per-hour free-fall, she bounced off a powerline and hit the ground “with a huge impact” on her right side. Moments later she heard voices, and realized she was still alive. Doctors at Milpark Hospital in Johannesburg were astonished to find she had suffered only a fractured pelvis and a few bruises. An 11-year-old boy, Rafael Batyrov, from the republic of Bashkiria in the Russian Federation, says he can see other people’s illnesses in the mirror. Rafael says that when he looks at someone’s reflection in the mirror, he can see a map of the person’s aura in it. The negative energy is accumulated in the places where the reflection is darker. A dark place indicates the location of a sick organ. Rafael discovered his gift about a year ago. He asked his father to sit in front of a mirror, and then listed all his father’s illnesses. His father had been smoking for more than 30 years. Rafael read out a prayer to a can of tap water and gave the water to him. His father drank the water and quit smoking the same day. The water also helped cure an alcoholic. Rasima Batyrov, Rafael’s mother, is a teacher at the elementary school that her son attends. “Rafael has already cured several of our teachers. Even the headmaster came to see my son,” she said. James Bernard Quilligan, managing director of the Centre for Global Negotiations and Brandt 21 Forum, was an adviser to the Brandt Commission and a consultant to the Secretariat of the Commission for Africa. Included below are two segments from his analysis of the newly-published Report of the Commission for Africa. For the complete article see Share International May 2005. A new North-South economic team — the Commission for Africa — in March 2005 issued a 400-page plan for development in Africa. The report, Our Common Interest, outlines a series of proposals for the poverty-stricken continent that will be discussed this year  at the G-8 and European Union meetings and other international conferences. Authored by UK Prime Minister Tony Blair, along with politicians and economists from nine African and five Western nations and China, the Commission for Africa report is a milestone in international development. Stressing the need for new leadership and participation in Africa, Blair’s Africa Plan calls for a global partnership to end poverty and conflict, and increase economic growth in Africa during the next decade. While many parts of the world are impoverished, the only region that is actually poorer than it was 30 years ago is Africa, where 43 of the 53 nations still suffer from chronic hunger and low income levels. The reasons for Africa’s economic regression seem endless. Famine and drought periodically plague large areas, leaving farmers overly dependent on good rains and good harvests. Mineral resources are exploited by foreign industries which take advantage of lax regulations and corrupt officials to avoid investing their profits locally, resulting in weak economies and incompetent governments in many regions of Africa. Without responsible administration, people are driven to violence, ethnic conflict, and civil war. Although 45 per cent of Africans are under the age of 15, their productive potential is diminished by hunger, cholera, yellow fever, malaria, tuberculosis, polio and HIV/AIDS. Many boys who manage to escape the ravages of starvation and disease become soldiers, while healthy but uneducated girls have little choice but to raise large families and become poor farmers. Africa’s share of global trade has been declining for several decades and the continent is increasingly dependent on foreign aid. The population — about 850 million — will increase to 1.9 billion by 2055, and, given current economic trends, in 50 years Africa will still be unable to produce enough food or earn enough money to import the agricultural products it needs to feed itself. There is no denying that Africa has suffered immensely from the perennial strife, endemic poverty and economic instability resulting from Western colonialism — and the utter failure of post-colonial attempts to help Africa during the past half-century. All of this has left Africa in much despair. Yet, as the Blair Report has noted, there are many signs of hope. The internecine wars that have plagued the continent are declining. Dictatorships are also disappearing. In the past five years, two-thirds of the nations in Africa have held multi-party elections (some, admittedly, more free than others). Domestic investment in productive capacity has increased in recent years, resulting in 5 per cent economic growth for 24 African countries in 2003. Africa has a young labor force that is willing and able to realize its potential, given the chance to thrive with adequate food, better healthcare, increased education and skill training. Africa’s mineral wealth is vast and largely untapped. The continent has the ability to double or triple its crop yields, feed its people, expand its access to global markets — and even emerge as a strong exporter of agricultural products in a few decades. Many nations in Africa are committed to a new collaborative effort among government, business, labor, civil society and faith-based organizations, which is sensitive to Africa’s cultural needs and individual rights. Many have also begun to organize grass-roots development programs, strengthen regional cohesion through the continent’s 10 regional economic associations, and strive for trans-national unity within the framework of the African Union and the New Partnership for Africa’s Development. Our Common Interest calls for a new partnership between Africa and the global community to forge a long-term plan for development at all levels and across all sectors of African society. Under this agreement, Africa would first do as much as it can for itself, recognizing that the best solutions for its future are uniquely African. ... 2005 will mark a turning point in global development. For the first time in 25 years poverty is back on the international agenda, and the international community must take advantage of this unique political moment. Africa is far more than a moral test for humanity — it is a window on what is possible for the entire world, a crucible for the emergence of geo-democratic governance and global economic co-ordination. In spite of its detractors, the Africa Plan pushes the political envelope about as far as possible in today’s market-driven climate, and with a good start on development reforms in Africa, a Global Marshall Plan and other global macroeconomic changes may follow in time. With the massive humanitarian response to the tsunami disaster in December 2004, the March publication of the Commission for Africa report, discussion of the Africa Plan at the G-8 summit and the European Union in June, the September UN Millennium High-Level Review, and resumption of the Doha Round of World Trade Organization negotiations in December, this is the best opportunity since the early 1980s for the global community to make progress on poverty and development. It is vital that the world peace movement, international labor, the sustainable development community, civil society organizations, government policy networks, multinational corporations and world citizens join together — this year — to make their voices heard in support of Africa. Just as the Brandt Report had a powerful and lasting effect, the Africa Plan may have an even greater impact upon the nations of Africa, the field of international development, and global economic planning far into this century. Enabling the African continent to build up and develop its productive capacities — and realize its full human, social and economic potential — is a monumental challenge, and whether or not this vast project succeeds in all respects, the entire world will be better off for the Africa Commission’s new leadership and profound determination to make a real difference for the people of Africa. Heads of state in the developed world must now find the political courage and resolve to implement these recommendations, and the global public must stand up and demonstrate its support. Now is the time to reverse economic stagnation, political strife, and social upheaval in Africa. Either the Africa Plan will become a clarion call for our generation to mobilize the political will to end poverty in Africa — or a shameful symbol of our failure to deliver real change, condemning the African people to a future even more tragic than today. The Bush administration’s second term has seen an increase in “people power” worldwide. The Tellhim.no campaign’s aim was to inform Americans and alert them to the need to take action and rediscover en masse their popular power. Torgeir Knag Fylkesnes, one of the people behind the campaign, was interviewed for Share International by Ana Swierstra Bie. A shortened version of the interview follows. See Share International May 2005 for the complete version. Share International: How healthy is democracy now? Torgeir Knag Fylkesnes: There is the principle “for the people, by the people”. Where do we see this in practice? Many people feel a lack of respect for politicians; I believe it is legitimate. What we experience from politicians is a sort of contempt for the public. They ignore the opinion of the people and see it as irrelevant — as if people didn’t know anything. It is a very condescending attitude. Foreign policy has come much closer, through access to much more information; we can see better what is happening in the world. There is an interest and a competence growing in the population, a much more globalized attitude. Suddenly the diplomats on their pedestals are not the only ones who know what is going on any more; people are informed and do not just accept things. People have knowledge, and this leads to a feeling of responsibility. I believe there is a very strong commitment and a strong wish to change both the society we live in and the world. There is a growing awareness among people that society is going too far in many areas, that we must do something before it is too late. SI: And this knowledge is behind people’s growing involvement? TKF: Yes, I believe it is very important. We talk about the Information Technology Revolution. It is really a ‘power revolution’. When people have information, they also have power. If they do not know what is going on, they have no power. Through the openness that has been created in our society during the last 20 years, the power has moved downwards, but the structures have not allowed for this yet. This power revolution is making us all equal. We have to allow for this and make new structures that will express it in society. I believe this change of quality in politics is already on its way. SI: It is also the seriousness of the situation. While people recognize this and see the consequences, it seems the politicians choose to minimize it. TKF: When you hold a high position in politics, you move at a level where you easily lose perspective. You get involved in the overview, in large-scale planning, seeing people more as groups than as individuals. SI: Do many politicians lose touch with reality? TKF: Yes, I believe so. They do not see things that are clear at a grassroots level. Politics has moved very far towards pragmatism, and when there is no clear ethical guideline you do not care about the consequences of actions because you do not see things as being connected. You are even willing to overlook atrocities. But as moral beings we have no right to let these actions pass. Democratic politics should be based on people’s lives and needs, their thoughts and dreams, but it has become so removed from this. It exists on a level of management, and what happens in the democracy is lost sight of. People do not live on the level where politicians move, people live on the ground. Working with the Tellhim.no campaign gave me so much hope. I believe we barely scratched the surface of all the support we could have created if the campaign had been organized differently. Something lies dormant here which we have not managed to release yet. The question is just to find new ways to get it activated. Instead of thinking from top to bottom, we have to start where people are. If we manage to unite and direct this new power that is there in the people, then we can achieve anything. It is very interesting to see what is happening in the USA. A strong social movement has emerged, because of Bush. More and more people are joining in, many millions already. It is becoming more organized and getting a clearer sense of direction; people are agreeing upon common goals, in spite of other differences. SI: So there is much power in this people’s movement. TKF: Yes, there is real power in it. Ten million people worldwide participated in the demonstrations in February. That’s more people than all the biggest armies of the world together. China’s army, for instance, the largest in the world when it comes to the number of people, consists of about 1 million people. If the social forces manage to keep up the pressure we can influence politicians to take clear standpoints. Then we can get a clear voice from enough countries. The USA is also concerned about having allies in the world. That fact could help reduce the extremism that is happening now. The Arab countries would then get a different picture. It is not that the whole Western Christian world is against them; there are actually very many who think that what is happening is horrible. Muslims would see then that the picture has more nuances. All such things would help. It will not take long. I believe the change will have to come from the grassroots level, because that is where the clear opinions are. And we will never give up! SI: So what should one do? TFK: There are many different challenges, but the most important thing is to co-operate. There must be a strong united chorus of countries that state their opinion very clearly and who can put pressure on the US to join committed world co-operation. There are only two countries in the whole world who have not signed the Convention on the Rights of the Child, and they are Somalia and the United States of America. This is a typical example of how the Americans think. They are chronic in their attitude of not wanting to commit to what the unity of nations in the world wants to be common rules. The different nations must join together in solidarity and strength in order to demand this commitment from the US. I believe one also has to work to mobilize the Americans themselves. We need to work internationally, but also nationally, and locally, person to person. SI: So one has to put pressure on the politicians? TKF: Yes, that is very important. We have to make them understand very clearly the need to uphold our values and goals, and to do this together with other countries. We do not believe the world will become a better place if one very powerful nation acts alone and starts conflicts all over the world, the consequences of which will spiral into new problems. SI: How do you see the future? TKF: Change is possible. If everybody had agreed to the present situation, agreeing that this is the kind of world order we want, then I would have been a pessimist. But because the active involvement throughout the world is so great, not least in the US itself, everything hangs in the balance now. The scales in the world are just about to tip from one world order to another. We only have to dare. We have to give it the push so that the scales tip. In order to make that final push we need to be optimistic. Hannan Aruri is a Palestinian volunteer working to promote women’s rights in her country. In January 2005 she travelled to the World Social Forum in Porto Alegre, Brazil, in order to tell the world of the daily ordeal endured by the people of Palestine. Olivier Danes interviewed her for Share International about the right to travel which civilians of an occupied country are supposed to enjoy. Share International: Please tell us about your journey to Porto Alegre. Hannan Aruri: I live in Ramallah, 25 km (16 miles) from Jericho on the Jordanian border — less than a half-hour trip by the direct route, but this road is reserved for Israeli military columns only. Palestinians have no rights to use it, so we have to take a secondary road that goes through the mountains and passes through two checkpoints. I left Ramallah at 5am and reached Jericho at 7am. There, Palestinians are obliged to take a bus to the first barrier, where we have to queue for about two hours for an Israeli soldier to check our papers. Then another bus drives us to the border. There, in silence, we must once again suffer humiliation at the hands of the soldiers who threaten us for nothing — for not queueing ‘correctly’ and other such ridiculous pretexts. We never know whether they will let us go on or not — every day, people are sent back and we do not know why. Some have to undergo interrogation. This has also been my experience. I was made to enter a room where they made me wait. Then they asked me a few questions: where are you going? What for? Who are you going to meet? Then they made me wait again for an hour. Next I was driven in a bus which dropped us at the place where we could get our luggage back — after a wait of one-and-a-half hours. Another bus and there we were on the Jordanian side, and yet another rigmarole of checking our passports, and another two hours wasted. In Amman, I took a flight to Paris, then another to Porto Alegre. On the way back, I’ll have to suffer the same difficulties to get back home. SI: What a terrible ordeal! HA: It is, but it’s a lot worse in summer, when more people go and visit their families. Then, travelling between Ramallah and Jericho takes up to 12-13 hours. The Israelis do not put more soldiers on duty at the checkpoints when there are more people wanting to travel: we simply have to wait. As for crossing the Jordanian border, it takes 4-5 days in summer, in temperatures of 45-50 Celsius, with children crying and parents in a state of panic. These are the Israeli ‘security measures’. However, I cannot afford to leave Palestine more than once a year. You have to pay each time you take a bus, you have to eat and get accommodation on the border, apart from the many taxes and the time wasted. Palestinian people live a real state of apartheid. We are isolated in our villages, whose accesses are blocked by big concrete barriers. Getting around is dangerous, or even impossible. Whether it be on foot, by car or by bus, to get to the next village, to work, to school, to the doctor or visit one’s family, you have to cross at checkpoints, where waiting times are never-ending. People with heart problems have died on the way because they were unable to reach hospital in time. Women give birth in ditches while indifferent soldiers hardly pay them any attention. Any decent person of goodwill would manage to help pregnant women to cross a border or assist those accompanied by young children. But the soldiers show such cruelty that it leaves us speechless. And what must our children think of us? I have two children, aged three and five. I would like to protect them from these insults, but even though their father is French they have no right to leave the territory with him. He can cross the border easily, but our children, because they were born in Palestine, can only cross the border with me. SI: But why do you have to pass through Jordan? HA: Because Palestinians have no right to use Tel Aviv airport any more. We have to go via Amman, which needs a special authorization from the state of Jordan that usually takes one week to get. To travel abroad, in whatever country, Palestinians must get a visa — and although countries have their embassies in Israel, we are not allowed to go to Israel! SI: Do you feel abandoned? HA: Totally. There, in Palestine, and anywhere on the route I described, information is also under Israeli control. For instance, it is strictly forbidden to take pictures of checkpoints or buildings in which we are crammed and forced to queue for days. Yes, we feel completely forgotten. That is why I try to go out and inform people about how we live. And it has been a great comfort to see that here, in Porto Alegre, many more people than I had imagined support our cause. On 19 March 2005 protests took place around the world to mark the second anniversary of the invasion of Iraq and to protest against the continuing occupation. Demonstrations took place in Tokyo, Madrid, Istanbul, Copenhagen, Bombay, Lahore, Rome, Florence, Ankara, Athens, Rome, Brasilia, London, Dublin, Glasgow, Mexico City, Warsaw, Vancouver, New York, San Francisco, Los Angeles, Budapest, Puerto Rico, Sydney, Auckland, Wellington, Brussels, Winnipeg, Kuala Lumpur, Toronto, Santiago, Nicosia, Cairo, Montevideo, Sao Paulo, Johannesburg and many other cities. In the US, protests took place in over 800 communities, more than twice as many communities as during the 2004 anniversary of the war. Thousands gathered in large cities — San Francisco, New York, Chicago and Los Angeles — and many more took part in demonstrations in smaller communities in all 50 states. The protesters were a diverse group including families with children, students, religious groups, professionals and working people joining in rallies, marches, vigils and concerts. The extraordinary breadth of the anti-war activities reflects the vitality of grassroots peace activism. Many events featured family members of active-duty soldiers, veterans of this and previous wars, and relatives of injured or killed service people, all speaking out against the continued US military occupation of Iraq. At Fayetteville, the home of Fort Bragg and the Army’s 82nd Airborne Division, more than 4,000 people joined military families and veterans to say that real support for the troops means bringing them home. Led by people carrying banners stating “The world still says no to war” and “Bring the troops home now”, the gathering included Iraqi Veterans Against the War and Military Families Speak Out. A series of speakers told stories of loved ones who have died during the war and occupation. The event was the largest demonstration there since Vietnam. Also in the US there were courageous acts of civil resistance: 35 people occupied the office of Congressman Tom Allen in Portland, Maine, to protest against his recent vote in favour of the $82 billion war appropriation; 70 people shut down a military recruiting centre in Eugene, Oregon, for a day; and in New York City, 30 people were arrested at simultaneous civil disobedience actions at military recruiting centres in Brooklyn and Manhattan. Demonstrators in the central Asian nation of Kyrgyzstan took control of the country’s presidential headquarters and forced the nation’s long-time President to leave office, in the third successful popular revolt in a former Soviet republic in 16 months. The speed of the government’s fall surprised many of its opponents. The opposition, protesting disputed parliamentary elections that had taken place in February and March 2005, seized major cities in the south. Their first demonstration in the capital two days later was small and easily dispersed by riot police. But the following day, demonstrators gathered in larger numbers, marched on the presidential compound and burst inside after struggling with supporters of former President Askar Akayev. The opposition took control of a pro-government television station and organized the release of Felix Kulov, a former interior minister, who then addressed the nation on television. Prime Minister Nikolay Tanayev offered his resignation. Senior officials in the security, interior and defence ministries quickly began working with the new authorities, according to opposition leaders. Kurmanbek Bakiev, a former Prime Minister, was declared acting President. He said elections for a formal successor to Akayev will take place in June 2005. Kyrgyzstan’s revolt followed popular uprisings in two other former Soviet republics, Ukraine and Georgia. Brazil’s Indian rights advocates began their ‘Indigenous April’ campaign at the beginning of April 2005 — a series of national protests, occupations and other actions. The Indian activists were inspired by a similar month-long protest by another Brazilian group in April 2004: the Landless Workers Movement, or MST. Dubbed “Red April”, the MST spent April 2004 seizing increasing amounts of private land to draw attention to their ongoing demand for agrarian reform. Indian groups are calling for the government to step up its efforts to allot more federal lands for reservations, as noted in the constitution. Indian advocates accused the federal government of a lacklustre effort to create Indian reservations, criticising the administration of President Luiz Inacio Lula da Silva. The group also called for an immediate improvement in medical care on reservations, citing the death of more than a dozen Kaiowa Indian children on a reserve in March 2005. The complaints against the Lula administration followed the release of a human rights report claiming Brazil’s indigenous population continues to face threats of violent attacks and discrimination. Amnesty International said that “while there have been some advances in respect for their (Indian groups’) rights over the years”, Brazil’s native population continues to suffer unfair treatment from the federal government, private landowners and agro-business interests in the Amazon. “The continuous failure of Brazilian governments to act effectively to protect indigenous communities has exposed them to human rights violations and has laid the foundations for the violence of the present,” said Amnesty International. Chief among complaints by Amnesty International and the tribes has been the failure to create all 580 Indian reservations mandated by the 1988 constitution, which was due to be ratified in 1993. So far only 340 have been created, though Brazil’s Ministry of Justice claims the process should be completed by 2006. South Korea has halted construction of a planned bullet-train tunnel after pressure from religious and environmental groups forced the government to agree to unprecedented environmental research and consultation. The campaign to stop the construction of 118 km of track through environmentally-sensitive Mount Cheonseong in Yangsan, South Gyeongsang Province, has been spearheaded since 2001 by a prominent Buddhist nun. The Venerable Jiyul Sunim, 48, has undergone three hunger strikes — the most recent planned to last 100 days — to focus attention on the project, which protesters claim will drain marshland and eradicate the habitats of several endangered species, including a rare salamander. Jiyul, whose health is believed to have seriously deteriorated during her latest hunger strike, ended her fast on 3 February 2005, when the government proposed conducting a new environmental study on the impact of the project on the mountain’s ecology. A former US Marine involved in the capture of the man now presented as former Iraqi President Saddam Hussein has said that the public version of the man’s capture was fabricated. Former Sergeant Nadim Abou Rabeh, of Lebanese descent, told Saudi newspaper al-Medina that the capture took place on Friday 12 December 2003, and not — as announced by the US Army — the day after. An American national correspondent specializing in covering US war wounded has reported that the US government is concealing the scale and extent of the injured by flying home the wounded soldiers, hundreds at a time, under cover of darkness. Mark Benjamin — awarded the American Legion’s top journalism award for his 2004 reporting on the hundreds of sick and injured soldiers at Fort Stewart, Georgia — has spent a year investigating and interviewing wounded soldiers at the US Army’s top hospital. He reports that all flights carrying war wounded are scheduled to land at night, and that photographers and media are barred from seeing, watching or taking photographs of the injured arriving, so the public does not get to see any of this. In spite of the ban, he succeeded in obtaining some images of very young soldiers who were badly injured. The Pentagon, he says, has refused to comment on the night arrivals, and deny that there is such a policy. In an interview with Amy Goodman on Democracy Now!, Benjamin — formerly a research reporter for United Press International and now correspondent with Salon.com — estimates the number of wounded US soldiers at 25,000, including those from accidents involving military vehicles etc which are not counted as war wounded by the Pentagon. Most of these soldiers were wounded on the battlefields of Iraq, while some were injured in Afghanistan. They are first flown to Germany on giant gray C-141 Starlifter jets. After being stabilized there for a few days, the most severely injured are landed at Andrews Air Force Base in the US. From there they are taken by bus or ambulance to Walter Reed Army Medical Center in Washington, DC, or Bethesda Naval Medical Center. According to Benjamin, soldiers who have sustained physical injuries receive excellent medical treatment, but the psychiatric care of soldiers with psychological trauma is “extremely substandard”. Soldiers suffering acute, debilitating post-traumatic stress disorder, who are “acutely homicidal, acutely suicidal after what they’ve seen or had to do in Iraq”, he says, “don’t get the kind of therapy they deserve. They don’t get one-on-one therapy. They’re treated by not even doctors, they’re medical students, and the entire time that they are at Walter Reed, the army seems to be more bent on trying to determine that their problems were not, in fact, caused by the war and that, in fact, these soldiers were just crazy of their own accord”. Curiously, Benjamin says, these wounded are people that the army appeared to think were psychologically in good enough shape to go to war, but later seemed to find out that their problems were their own. The army invariably blames pre-existing conditions to avoid financial liability for future care. He reports on several suicide attempts, including one that was successful. Dead wrong or dead dishonest? Writing in UK newspaper The Independent, former UN chief weapons inspector in Iraq Scott Ritter pours scorn on the report by the US Presidential Intelligence Commission set up to investigate intelligence which led to the US-UK attack on Iraq. In what many see as yet another blatant attempt at trying to shift the blame, the report, produced by the Presidential Commission on Intelligence and WMD, criticizes the CIA’s failure to provide an accurate assessment of Iraq’s weapons of mass destruction. Like other similar attempts at whitewash, faulty or incompetent intelligence is blamed. Ritter, however, advises ‘not letting the warmongers off the hook’. Ritter (author of Iraq Confidential: The Untold Story of America’s Intelligence Conspiracy, which is to be published in summer 2005) is uncompromising in his conclusion that “it is the policymakers — British and American alike — who must shoulder the responsibility for the Iraqi WMD fiasco”. He points out that this was a war of choice, not necessity.